Not a lot of booze here but the Centennial an Simcoe lead me to believe that this was stronger than it was in actuality. Dank, dry, and subtly bitter, this had enough going for it and fit in well with other beers of this style. 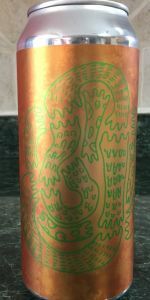 Love the label and lack of words on it, as this beer nearly defied description too. A welcome change from what put Tired Hands on the proverbial map! Thanks to TheIPAHunter for this one. A nice hazy golden color with a big, frothy white head. Great foam retention. Pineapple and tangerine on the nose with some faint earthy notes. I agree with the grassy description on the taste, well balanced with citrus and crisp bitterness. Easy to drink with a strong bready backbone. Cloudy very pale yellow with a thin bright white head. Decent lacing. Mild aroma. Very light tropical, soap and grass notes. Grassy hops up front in the taste. Soft mango and pineapple follow. Definite wheat. Light bitterness couples with a hint of mineral water on the backend. Great soft, slick feel with strong carbonation. Very refreshing overall.